Get ready for another thrilling motorsport event this year. Feld Entertainment is organizing a brand new series of Monster Jam and the upcoming Monster Jam Trucks Moline IL event has got the fans excited. The Advance Auto Parts Monster Jam shows generally conduct two kinds of competitions; Freestyle and Racing. If being held on a smaller scale, it hosts wheeling competitions and donut contests which are aimed at hitting a ramp and spinning the truck. The score of each participant at the end is then the deciding factor for the winners. Racing is a traditional competition in which the trucks are expected to touch the finish line, while Freestyle allows the spectators to watch the trucks doing stunts and tricks on the dirt tracks. Both the competitions are judged by placing a certain time limit which makes them even more thrilling while keeping the crowd to the edge of their seats throughout the show. The recent racing World Final Championship was won by Adam Anderson and the trophy for Freestyle competition was taken away by Tom Meents, with a score of 34. Who will win at the Monster Jam Trucks Moline IL event? 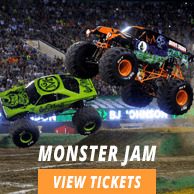 Find out by getting your Monster Jam Trucks Moline IL tickets and catch the action live. When the race is over you can even meet the participants at Pit Party and get autographs.